Authors such as Charlotte and Emily Brontë, JB Priestley, John Braine and Alan Bennett have been stirred by the landscapes of their youth, which have served to influence their novels. Now a new book celebrates the lives and works of a selection of writers, authors and poets whose work draws upon the varied scenes that make up the region. Yorkshire Literary Landscapes also examines how the landscape can help to define storylines and characters. Charlotte Brontë’s 1849 novel Shirley, for instance, has as its background the Luddite uprisings that beset the Yorkshire textile industry. Published under the pseudonym Currer Bell, the book is set around Birstall, with locations including the 17th century Red House in Gomersal, Kirklees Hall, Elizabethan Oakwell Hall - renamed Fieldhead by Brontë, and Gothic Dewsbury Minister. ‘In ‘Shirley’ the Yorke family live in Red House, which is renamed Briarmains. ‘Landscape is integral to the Brontë sisters’, says the book, by York-based author Paul Chrystal. He describes how, as a young woman, Charlotte went to work at Roe Head School in Mirfield, and when the wind blew, she reminisced about the blustery conditions that typified the Haworth landscape. To me, the ending is not that open at all. I think there are only two choices. I sometimes read this as a choose your own adventure because the pieces as I was writing them were very moveable. To me, the ending is either that you will choose life or you will choose death, and that decision lies in the reader, not me. Both are an absolute possibility at that moment. I like the idea that the choice lies with the reader. I think that’s the ultimate goal of good storytelling—a story that asks a reader: How does this make meaning for you? Which books would you take with you on a solo holiday? Right now I’m thinking of going back and reading some of the books that I grew up with including Anna Karenina, Pride and Prejudice, Wuthering Heights, Emma and Doctor Zhivago. Mis heroínas favoritas en la ficción. LM Montgomery, Laura Ingalls Wilder, the Brontë sisters, Edgar Allan Poe, Mark Twain, Louis May Alcott, Tracey Bateman, Tracie Peterson, Colleen Coble, Melody Carlson, and all the authors at Love Inspired have shaped my style and content over the years. Books that left a huge impression on me are An American Tragedy, Wuthering Heights, the Anne of Green Gables series, Nancy Drew mysteries, Jacob Have I Loved, and Say Goodnight Gracie. 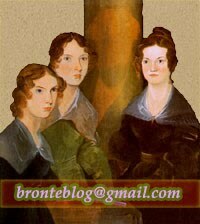 The Sydney Review of Books posts about Emily Brontë's 200th anniversary. Jane Eyre's Library (in Spanish) posts pictures of a recent Turkish edition of the novel.